At Last, The Real Secrets To Cashing In on Those PLR Products! "Warning! You Risk Losing Out On BIG Profits If Youre Not Putting Some Of That PLR Content On Your Hard Drive To Use!" Im barely making any money with the Private Label Rights content Ive got. It seems like Im wasting money and time because I dont seem to be getting anywhere. I have a lot of Private Label Rights Content just sitting on my hard drive collecting dust. I dont know what to do with it. I would like to learn how I can massively profit from Private Label Rights, but I dont have a clue on what to do or how to do it. Well, I have good news for you. You're about to discover the tested and proven techniques anyone can use to start raking in cash and earning a fortune with PLR. Introducing... 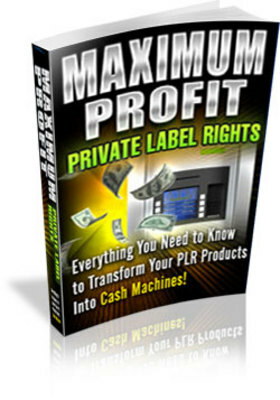 Maximum Profit Private Label Rights! With all you'll learn, you're probably asking...what is the cost for this invaluable e-book? Well, if you follow the techniques provided within its contents, the product will pay for itself 100 times over!